Aktabantay come out on top in a photo finish. Cracking race! Hugo Palmer's Aktabantay needed all of the seven furlongs and 16 yards to get his head in front and give the Newmarket trainer his first Group success. Pallister made the running before Lexington Times went on and looked like springing a surprise, but the stiff finish brought the field together and Aktabantay produced a final flourish under Ryan Moore to score by a short head from the 5-4 favourite Future Empire, who also came late. Moore told Channel 4 Racing: "He got pinched coming out of the stalls and I was sitting five of five and we weren't going mad. "I didn't want to go all the way round them. I got a nice split through, but Lexington Times got away and pinched a length or two. "It took him a while to get going too, I think he was just a bit green and inexperienced. Hopefully he'll come on for that." Palmer added: "Ryan said he got pinched coming out of the stalls and had to sit last. That wasn't the plan, but two down I thought he was going to win easily, but (Richard) Hannon's horse (Lexington Times) kept galloping and it took him a while to get there. "I don't know whether he wants better ground or a stronger gallop. I dream and hope as we go up in grade they will go faster and that will get him going. You can see why I put cheekpieces on him to make him concentrate. 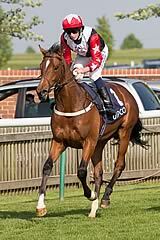 "It will be up to the owner and I know he is keen on the Dewhurst. I think he will be well suited by the Breeders' Cup Juvenile Turf over a mile in Santa Anita. "Outstrip was third in the Dewhurst before winning it last year, so we'll just see. He's a Group winner now and he's a valuable commodity." The Solario Stakes is named after Solario, a successful racehorse in the 1920s and subsequently a leading sire. It was first run in 1947, and the inaugural running was won by Panair. For a period the Solario Stakes was classed at Listed level. It was promoted to Group 3 status in 1986. The race was formerly held during Sandown Park's Variety Club Day, an annual fundraising event for the Variety Club. The 2011 running promoted the charity's Sunshine Coaches. In 2012 Variety Club day was moved to August and the sponsorship of the Solario Stakes was taken over by Candy Kittens.